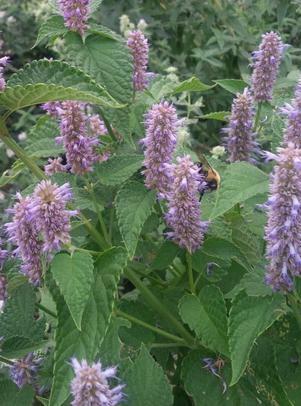 Anise hyssop is known as the bee plant for good reason. When it blooms in the summer, the plants are abuzz with bees of all sorts. Honey made by honeybees who have visited the lavender flowers is especially fragrant. Butterflies and hummingbirds also find the flowers irresistible. Their long tongues fit perfectly into the tubular flowers. In the fall, birds feast on the seedheads. Anise hyssop is a native plant indigenous to the prairies. Native Americans living in the area used it to flavor their food and believed that it had both medicinal and magical properties. The leaves were used in poultices to treat burns and brewed into a licorice flavored tea which was drunk as a treatment for fevers, diarrhea and coughs resulting from chest colds. Native peoples even used it to treat poison ivy rashes. Perhaps the most interesting use for anise hyssop was as a treatment for depression. The Plains tribes burned the dried leaves like incense. They believed that inhaling the fragrant smoke would alleviate depression. The flowers of anise hyssop were believed to have protective properties. Plains tribes included the flowers in their medicine bundles which were worn to protect them from danger. They also made protective amulets with the flowers. As settlers from the east made their way across the prairies, they learned how to use to the plant from the native peoples and anise hyssop entered Western herbal apothecaries. If you plan to grow this beauty in your garden, give it plenty of space. Anise hyssop grows in a clump that can be two to four feet tall and up to two feet wide. Its square stems give away its membership in the mint family so it is no surprise that it is invasive. If you allow the flowers to go to seed in the fall, the following spring will find your garden full of seedlings. Anise hyssop is easy to grow. It is drought tolerant so you don’t have to worry about watering it. Make sure you are growing it in well-drained soil. Wet soil makes it prone to crown or root rot. It is not bothered by insect or disease problems. 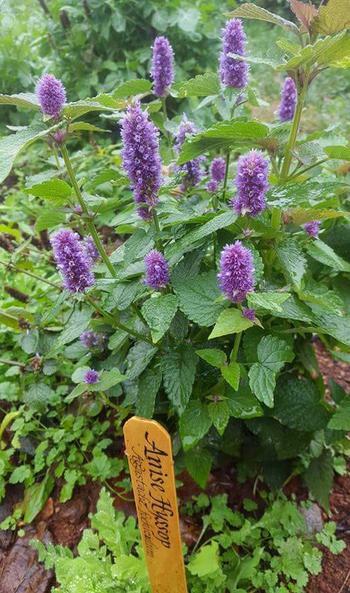 Plant anise hyssop in your garden and enjoy the many visitors it will attract while sipping a cup of delicious tea made from its leaves.